Make trades absolutely free of commissions, leverage fee, maker and taker fee, or any other fees. Leverage your crypto to access up to 20x+ in US$ funds to trade global and cryptocurrency markets. Delivered directly from global exchanges such as NYSE, NASDAQ, NYMEX, CME, BATS Europe, and crypto exchanges such as BITFINEX. Citizens and or residents of the United States and Canada are not allowed to use the Quantfury trading app. 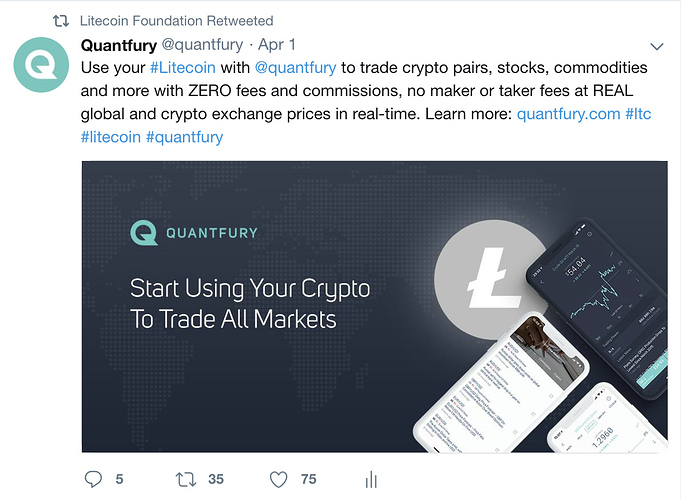 Visit www.quantfury.com to learn more.